was founded in 2008 in Bassersdorf/Zürich. 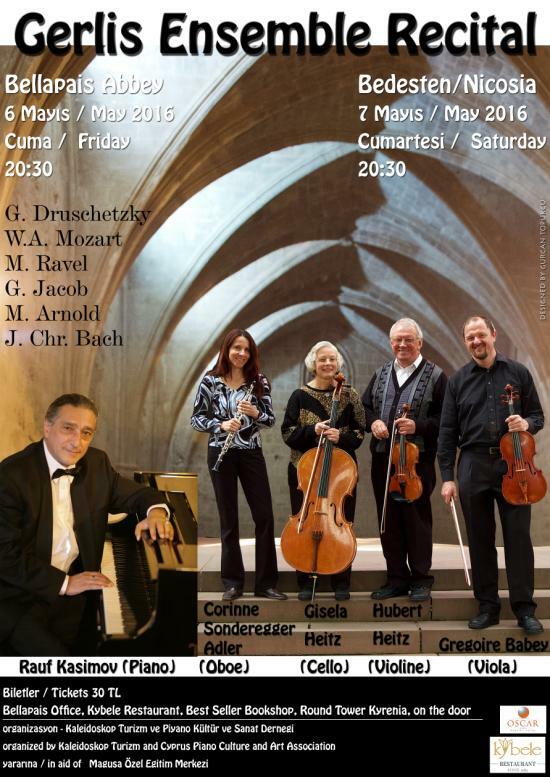 We will have the pleasure to listen to two concerts with carefully selected programmes, one at the Abbey in Bellapais again - here with the special guest to the GERLIS-ENSEMBLE our pianist Rauf Kasimov - and one a day later at the Bedesten in Nicosia. Please read the two programmes hereafter. The event was organised by Ms Irene Raab from KALEIDOSKOP Turizm in Kyrenia and Ayla Iriz from Cyprus Piano Culture and Art Association. The concerts both start at 20.30 hrs and tickets TL 30.00 are available at Bellapais Ticket Office, Kybele Restaurant, Best Seller Bookstore, Round Tower Kyrenia and at the door. 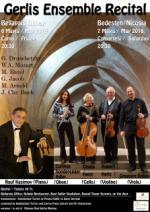 Hubert Heitz studied the violin with Prof. Jörg-Wolfgang Jahn in Karlsruhe and with Prof. Max Rostal in Berne. Later he studied chamber music with Prof. Albert Dietrich, with the Bartholdy Quartet and with Paolo Borciani of the Quartetto Italiano. In addition to extensive teaching – for years he was Prof. Jahn’s assistant; today he is a free-lance musician and teacher of violin and viola – he is to be heard both as solist and in chamber ensembles: formerly the Heitz Quartet (Karlsruhe) and the Nova Quartet (Basle), these days as violinist of the Orpheus Trio (Karlsruhe) and the Gerlis Ensemble (Karlsruhe/Zurich) and in recitals for violin and piano; he also directs the Collegium Musicum of the KIT (Karlsruhe Institute of Technology, formerly University of Karlsruhe). He has built up a reputation at home and abroad through his many solo and ensemble performances.